Michael James, head of Air Australia which collapsed last weekend, leaving estimated debts of A$30 million, is a man with a high-flying past.Born 34 years ago in New Zealand, he grew up in Bundaberg in Queensland. His stepfather, Gary Drysdale, worked at the local airport, where young Michael would help out at weekends and holidays. He never finished high school, leaving before his final exams to take a job as a check-in clerk. He eventually ended up on the management of charter and cargo company, Strategic Aviation. 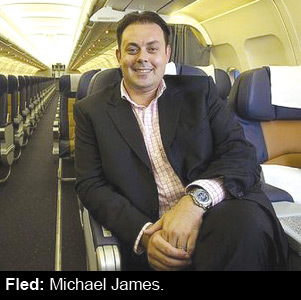 As an airline boss James rapidly gained a reputation for lavish spending and wild parties, and was regarded as a bright light of the Brisbane social scene. He quickly obtained the trappings of a luxury lifestyle, including a private jet and a five-bedroom home at Birkdale in Redland City, which featured a private gym and an in-house waterfall. In February last year James’ management partner, Shaun Aisen, a man credited with a cool business head, quit, leaving the one-time check-in clerk in control of the company. A string of other senior execs jumped ship after Aisen’s departure. In November last year James relaunched Strategic Aviation as Air Australia, with a fleet of four leased planes serving Bali, Thailand and Hawaii. To celebrate the launch he flew 200 guests from Australia to Hawaii for a five-day party featuring hula dancers and ukulele players at the exclusive Hilton Hawaiian Village resort. But with a severe lack of funds, the airline struggled to keep airborne, and according to insiders in recent weeks James had taken to selling off his personal assets in a desperate attempt to keep his dream alive. The house with the waterfall, the private jet and even James’ cars were reportedly hived off in attempts to find cash to pay staff and fuel bills. “Staff hold Michael James 100 percent at fault; he has led everyone astray, including senior management,” one disgruntled employee told Australian media at the weekend. Since the airline’s collapse James has gone off the radar, but he, his wife Rachel, and their four children are believed to be in Hawaii.